The Entrepreneurship Development Cell is committed to nurture and develop entrepreneurial skills in experiential manner among the students community. The mission of EDC is to mould entrepreneurial thinking in our students and to create a business opportunity in and out of the campus with a great stability to achieving social and economic progress through entrepreneurship. 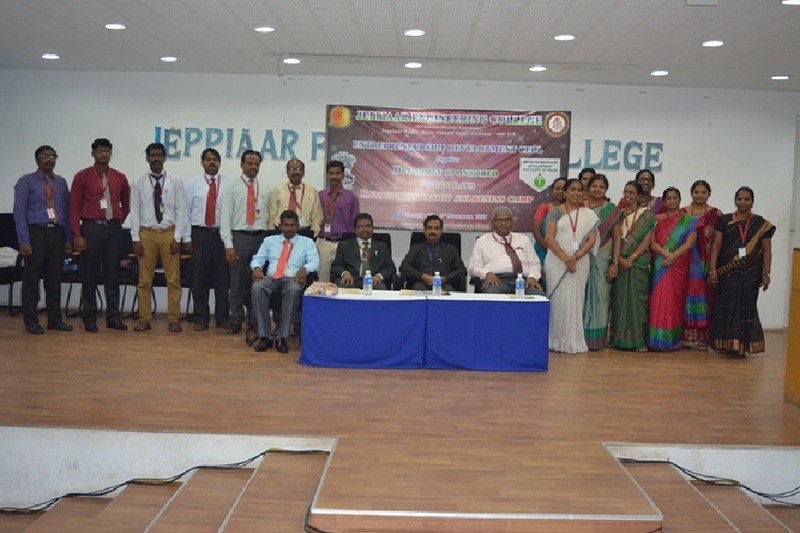 The EDC was established in Jeppiaar engineering college with faculty members from different department in the year 2004. It has been conducting the various entrepreneurship development programs in order to promote and inculcate the entrepreneurial skills in the minds of young students. The Entrepreneurship development institute(EDI) Tamil nadu along with Anna university Chennai has identified our college as one of the spoke colleges under the college – Innovation & Entrepreneurship development program(IEDP) on 18th October, 2016. All our EDC activity will be facilitated by Anna University being the hub institution for IEDP. The successful implementation of program is based on the structure the set of activities on campus, ideation, opportunity evaluation and selection, and most importantly, management involvement in the whole process. Mr.P.Chellapandi, Ms.B.Harini and Mr.S.Anbudasan are trained facilitators by EDII Tamil Nadu.